Summary. Aim: To study the correcting effects of microgranulated HSGD enterosorbent on hematological, morphological and biochemical indices of paraneoplastic syndrome in mice with highly angiogenic variant of Lewis lung carcinoma LLC/R9. Methods: The study was performed on male С57/ВL6 mice with transplanted LLC/R9. Enterosorbent HSGD was administered daily at a dose of 0.625 g/kg for 2 weeks starting from 7th day after tumor cell transplantation. When enterosorption was completed, an analysis of peripheral blood, biochemical indices and morphological structure of tumor, lung, liver, spleen and thymus was carried out by standard methods. Results: It has been shown that administration of enterosorbent did not affect LLC/R9 growth but resulted in nearly two fold decrease of the volume of lung metastases (p < 0.05). 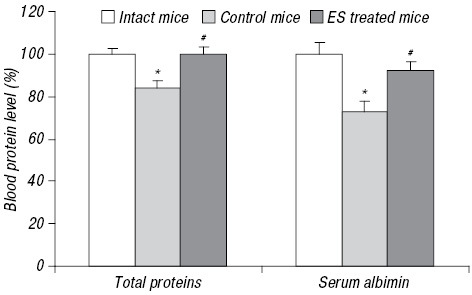 Erythrocyte number and hemoglobin level were higher by 30.0% (p < 0.05) and 23.3% (p < 0.05), respectively, in mice treated with enterosorbents as compared to untreated animals. In addition sorbent treatment completely normalized the thrombocyte index resulting in elevation of platelet number by 54.5% (p < 0.01) up to their level in intact mice. The morphological examination of liver and biochemical analysis of peripheral blood evidenced on significant positive correcting effect of enterosorption on histological structure of this organ and its functional acti­vity. Normalization of total proteins and serum albumin level as well as significant decrease of total lipid concentration by 29% (p < 0.01) in blood of treated mice were observed. Conclusion: Positive influence of microgranulated carbon sorbent on some hematological, morphological and biochemical indices of tumor associated symptoms in LLC/R9-bearing mice denotes that enterosorption-based therapy can be considered as a prospective treatment for correction of some paraneoplastic syndrome signs in cancer patients. Abbreviations used: GIF-1а — hypoxia-inducible factor-1а; ES — enterosorption; LLC — wild-type of Lewis lung carcinoma; LLC/R9 — highly angiogenic variant of Lewis lung carcinoma; PNS — paraneoplastic syndrome; TAA — tumor-associated anemia. It is known that malignant tumor due to its systemic influence on an organism is capable to induce the development of paraneoplastic syndrome (PNS) which encompasses significant metabolic malfunctions, immune conflict between the tumor and a host, complex changes in the structure and functions of many organs and systems. The phenomenon of PNS is mediated by humoral factors of tumor origin (hormones, cytokines) or cytokines produced by effector cells of antitumor immune response [1, 2]. According to the statistical data, PNS is observed in 7–15% of cancer patients and is life treating in many cases . Among the most severe malfunctions caused by systemic influence of cancer process one could mention tumor-associated anemia (TAA) which affects approximately 30% of primary cancer patients  while in the patients treated with chemotherapy, its rate achieves 90% . An analysis of TAA influence of survival of cancer patients has shown that an average annual risk of death is by 65% higher in the patients with anemia than in the patients without TAA . Lung carcinoma which is characterized by the highest PNS incidence among all cancer types, is accompanied with TAA in 71% cases . Transfusion of allogeneic red blood cells causes quick elevation of hemoglobin level and hematocrit and is among known means for anemia correction . ­However, this approach provides just short-term effect and is accompanied with hemolytic reactions, the risk of development of many complications, in particular heart failure, alloimmunization, disturbed homeostasis and the risk of bacterial contamination and viral pathologies . As far as an important factor responsible for anemia development in cancer patients is the relative or absolute deficiency of erythropoietin, a key regulator of erythropoiesis, for TAA treatment one could use erythropoiesis-stimu­lating agents, including the preparations of recombinant erythropoietin of first generation which possess high efficacy but short-term action, and the preparations with prolonged effect. However, this approach also is imperfect, because after treatment with erythropoiesis-stimula­+ting agents there is a risk of side effects development such as tromboembolic complications affecting total survival and possible stimulation of cancer process . Apart from this the majority of experts consider it reasonable to use erythropoiesis-stimulating agents only in patients who underwent chemotherapy excluding the ones with myelodysplastic syndrome. Another way for TAA correction is based on elevation of expression of the genes — targets of hypoxia-inducible factor-1а (GIF-1а), a key regulator of pathophysiologic response toward hypoxia, in particular, the gene of erythropo­ietine using compounds capable to suppress ­HIF-prolyl-4-hydrolase [11, 12]. However, if one accounts the role played by GIF in tumor development, the use of GIF inhibitors could be risky. So, the development of alternative methods for TAA correction is still very actual task. Enterosorption (ES) could be considered as an active method for correction of some paraneoplastic symptoms including paraneoplastic anemia. As it was shown carbon enterosorbents possess special properties which make them capable to normalize cytokine profile, endothelial dysfunction and some immunological parameters, to mitigate the manifestation of myelosupression, to elevate functional activity of detoxification systems and to improve their morphological parameters and regenerative potency . So the main purpose of the work was to study the influence of ES on paraneoplastic symptoms in mice with highly angiogenic variant of Lewis lung carcinoma (LLC/R9), the growth of which is accompanied with expressed PNS manifestations, in particular development of anemia, thrombopenia, hepatomegaly, splenomegaly and thymus involution . LLC/R9 was generated from the wild-type of Lewis lung carcinoma (LLC) strain after 9 sequential cis-DDP courses in vivo and following adaptation of tumor cells in vitro . High angiogenic potential of LLC/R9 cells as compared to LLC has been evidenced by (і) 1.5 fold higher rate of VEGF secretion in vitro; (іі) more expressed ability to induce vessel growth on chick embryo chorioallantoic membrane; (ііі) higher sensitivity to the action of antiangiogenic agents [16–19]. In the study, male С57/BL6 mice 2–2.5 months old weighting 18–23 g (n = 40) bred in the animal facility of Institute of Experimental Pathology, Oncology and Radiobio­logy of the National Academy of Sciences of Ukraine (Kyiv, Ukraine) were used. The research was performed in accordance with the rules of local committee on ethic aspects of work with experimental animals. LLC/R9 cells were cultured in vitro in RPMI medium (Sigma, USA) supplemented with 10% fetal calf serum (FCS), 2 mM L-glutamine, and 40 mg/ml gentamycine at 37 °C in humidified atmosphere with 5% CO2. Tumor cells were inoculated intramuscularly (1•106 cells per animal in 0.1 ml of Hanks’ solution). At the next day after transplantation animals were randomized by weight, and distributed in 2 groups (11 mice per group): control group (without treatment) and experimental group (treated with fine fraction of granulated HSGD enterosorbent). Enterosorbent was administered via tube daily starting from day 7 after tumor cells inoculation for 2 weeks. Total dose of enterosorbent was 0.625 mg/kg of animal’s body weight. Body weight and tumor size for each mouse were recorded 3–4 times a week. In a day after the end of ES treatment (on 21st day after tumor cell inoculation) mice were sacrificed. The size of metastatic nodules and their number on the surface of five lung lobules of each mouse were determined using a binocular with dimension glass. where di — linear size (mm) of the tumor; nj — number of metastases with diameter dm(j) (mm). The main hematological indices were determined using the hematological analyzer “Particle counter model PCE 210″ (ERMA, Japan), adapted for the study of blood cells of mice. where OW — weight of corresponding organ; W — weight of mouse. For histological analysis paraffin-embedded tissues including thymus, spleen, and liver were sectioned in 5 mm thickness and stained with hematoxylin and eosin (H&E) according to a standard procedure and examined by light microscopy. Microphotographs were done using System Microscope device with camera recorder Olympus BX 41 system, supplied with digital camera Camedia C-5050 zoom and program Olympus DP 80 FT 3.2 at the basis of Pentium 4 with operation system Windows XP. Plasma concentrations of total proteins, albumin, total lipids, phospholipids, cholesterol and triglyce­rides were determined using test kits BioSystems (Spain). Statistical analysis of obtained results included descriptive statistics, Student’s t-test, Mann — Whitney u-test was carried out using Statistica v.7.5 program. The characteristics of tumor growth and metastasis as well as physiological characteristics under study were averaged per each group. Mean values and standard errors were calculated and were used for figure and table presentations. The data in Fig. 4, 6, 7 are presented as percent of their level in intact mice. The obtained results showed that ES didn’t stimulate LLC/R9 growth. As it seen in Table 1 tumor volume in ES treated mice didn’t differ from that in control animal during all period of observation. This result has been supported by an analysis of histological structure of tumor tissue. By their microscopic structure the tumors of animals from control group and animals treated with ES were similar (Fig. 1). In tumor tissue there have been observed the massive regions with the cells at the state of expressed dystrophy and necrobiosis as well as necrotic areas what could be related to the large size of the tumors in both groups of the animals. 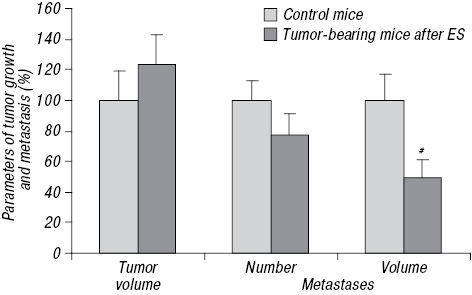 Administration of enterosorbents into the mice resulted in inhibition of metastatic process, which became apparent in both a tendency to the reduction of the number of lung metastases and significant decrease of their volume by approximately 50% (p < 0.01) as compared to control group (Fig. 2). 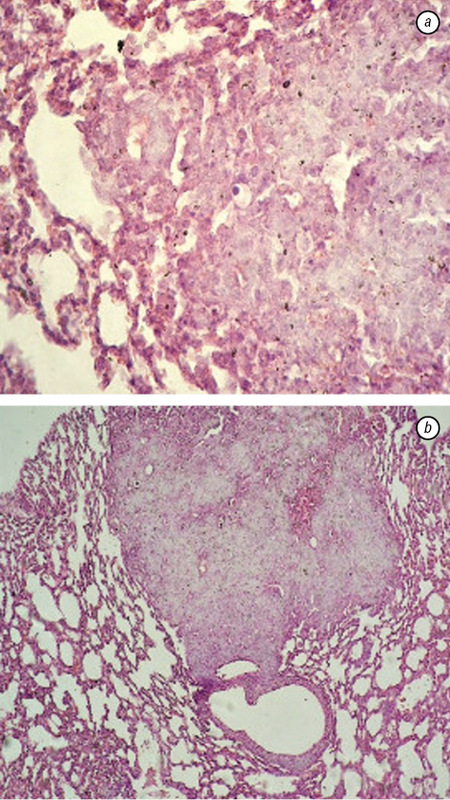 Apart from surface metastases which were counted during macroscopic examination of the lungs, on histological slides of lung tissues of mice from both groups there have been detected metastases localized mostly close to blood vessels (Fig. 3). Morphological structure of lungs of mice from both groups was characterized by damaged interalveolar membranes, sometimes with their dilacerations and formation of large blebs what evidenced on respiratory malfunction. Also, in the preparations there were observed large regions of hemorrhages where parenchyma was soaked with erythrocytes, supposedly due to metastatic process in the lungs. In the absence of significant effect toward the growth of primary tumor, there has been documented an ability of entersorbent to correct the manifestations of tumor associated anemia and thrombocytopenia in LLC/R9 bearing mice. As it was mentioned previously the growth of LLC/R9 in mice without treatment caused both a statistically significant (p < 0.05) decrease of red blood indices (including reduction of erythrocyte number on 40% and hemoglobin content on 41%) as well as considerable fall of platelet number on 47% (p < 0.01) (Table 2, Fig. 4). Note: *difference vs. intact animals is statistically significant, р < 0.05; #diffe­rence vs. control mice is statistically significant, р < 0.05. RBC — erythrocyte number; Hgb — hemoglobin content; Ht — hematocrit; MCV — volume of erythrocyte; MCH — hemoglobin content in erythrocytes; MCHC — hemoglobin concentration in erythrocyte; RDW — red blood cell distribution width; PLT — platelet number. Analysis of peripheral blood showed that ES improved some indices of red blood. 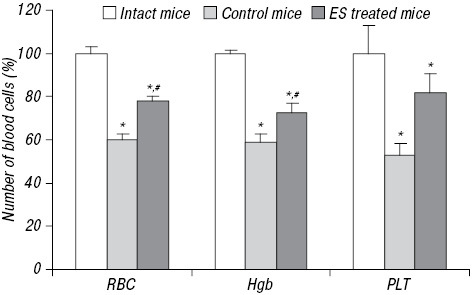 In mice treated with enterosorbents the erythrocyte number and hemoglobin level were higher by 30.0% (p < 0.05) and 23.3% (p < 0.05), respectively, as compared to control mice. But these hematological indices remained lower than that of intact animal. In addition administration of enterosorbent completely normalized the thrombocyte index resulting in elevation of pletelet count on 54.5% (p < 0.01) up to their level in intact mice (Fig. 4). Slight changes are observed in leukogram of mice after ES treatment (Table 3). In the absence of a conside­rable influence of LLC/R9 growth on leukogram indices oral dosing of sorbent gives rise a redistribution of white blood cell composition which is characterized by the reduction of monocyte portion and an increase of granulocyte one. 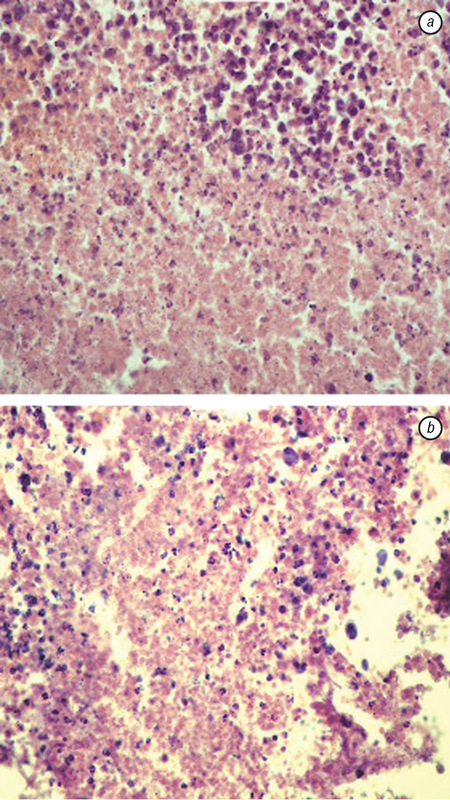 Extensive manifestation of the hematological PNS in LLC/R9 bearing mice without ES treatment is accompanied by formation of extramedullary hemopoiesis, which is displayed in hepatomegaly and splenomegaly . As it is seen in Table 4 the cellularity and weight index of liver in tumor-bearing mice is 60% (p < 0.01) higher than these of intact animals. Note: *difference vs. intact animals is statistically significant, р < 0.05. WBC — white blood cells; LY — lymphocytes; Mo — monocytes; Gr — granulocytes. Note: *difference vs. intact animals is statistically significant (р < 0.05). 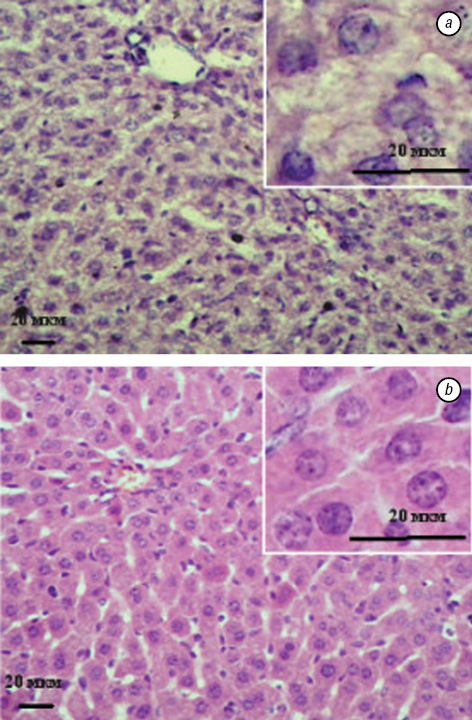 In LLC/R9 bearing mice hepatomegaly is accompanied with pathologic changes of morphologic structure of liver (Fig. 5, a). Normal trabecular structure of the particles is altered, perisinusoidal spaces became widened, the signs of anisonucleosis became more expressed: the sizes of nuclei ranged from moderate to very large and light, there were observed hepatocytes at the state of mitosis. 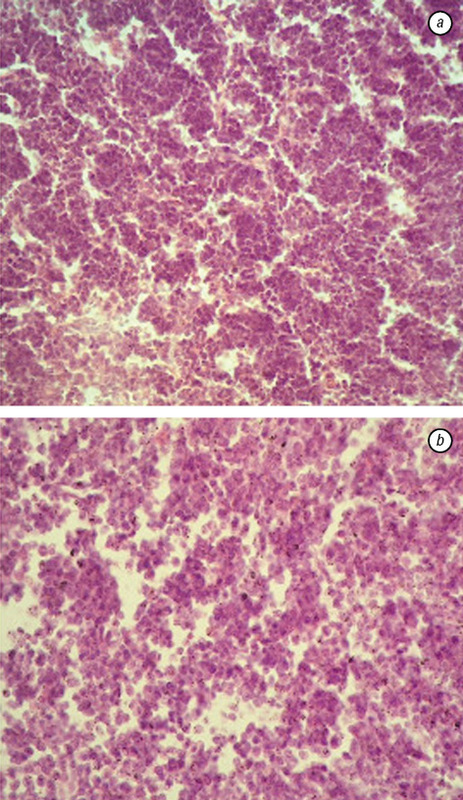 Hepatocytes were mostly low-stained with the signs of parenchymatic dystrophy, sometimes there were seen nearly transparent cells with cytoplasm vacuolarization and pictotic nuclei, and also the regions of necrobiosis and necrosis. These pathologic changes in liver precondition malfunction of this organ resulting in the decreased levels of the total proteins by 16% (p < 0.05) and serum albumin level by 27% (p < 0.05) in blood of tumor-bearing mice (Fig. 6). Against the background of hepatomegaly the level of total lipids in the blood plasma of tumor bearing mice was six time higher than that of intact animal (Fig. 7, a). The concentrations of phospholipids and cholesterol were higher on more than 20% (p < 0.05), while the concentration of triglycerides was lower on about 20% (p < 0.05) in comparison with these indices of intact mice (Fig. 7, b). Despite the fact that after ES there was observed no significant alterations in liver weight and cellula­rity (Table 4), the state of liver parenchyma histological structure was significantly better and close to the normal one. While in a part of liver dystrophic changes still remained, the presence of large regions with normalization of morphologic structure has been observed (Fig. 5, b). The trabecular structure of hepatocytes inside these regions was restored. In the majority of the micropreparations hepatocytes preserved their polygonal shape, possessed fine structure of nuclei and homogenous cytoplasm staining what may evidence on possible normalization of functional activity of liver. This assumption has been supported by the data on the levels of lipids and proteins in blood of mice treated with enterosorbent. As it is shown on Fig. 6, administration of the sorbent resulted in practically complete normalization of the levels of total proteins and serum albumin level conditioning the elevation of their blood level by 19% (p < 0.05) and 27% (p < 0.05), respectively. Administration of enterosorbent also resulted in significant decrease of total lipid concentrations on 29% (p < 0.01) in blood of treated mice (Fig. 7, a). 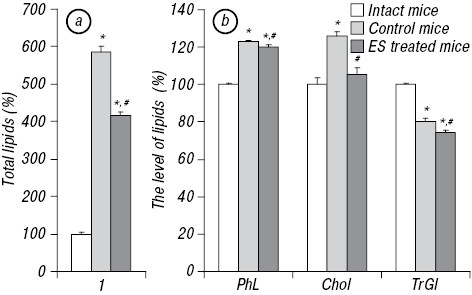 The blood content of phospholipids and triglycerides in these animals was shown to be slightly reduced, while cholesterol level was 17% lower (p < 0.01) in comparison with this index of control mice (Fig. 7, b). It should be noted that oral dosing of sorbent didn’t affect the tumor associated splenomegaly. No changes of spleen weight index and cellularity were observed in ES treated mice in comparison with that of control animal. Meanwhile general morphological picture of spleen after ES was much better. The morphologic picture of spleen in tumor bearing mice (in the absence of ES) evidenced on its disturbed structure: there were absent distinct margins between white and red pulpa as it should be seen at normal state (Fig. 8, a). The quantity and area of lymphoid follicles (white pulpa) was significantly decreased. Red pulp hyperemia was observed along with homogeneity of cellular composition and moderate cell density. After administration of enterosorbent the visual ratio between lymphoid nodes and red pulpa was notably expressed. The structure of lymphoid follicles was homogenous (Fig. 8, b). Some number of follicles possessed the distinct germinal centers with blast elements and macrophages. In red pulpa there was more expressed density of placement of various cellular elements. All mentioned above pointed on some normalization of morphologic structure of spleen. In contrast to the liver and spleen, administration of enterosorbent didn’t affect any sign of thymus involution: no changes of weight index, cellularity and morphological structure of thymus has been observed (Table 4). Histological examination of the thymus of control mice and ES treated showed similar morphological structure. This structure was characterized by a sharp shrinkage of the cortical zone, which was known for the maturation of the pre-T-thymocytes of the bone marrow to T-lymphoblasts and their proliferation (Fig. 9). Medullar zone was characterized by a marked reduction of the number of lymphoid cells as well as by formation of small cell-free cavities. The results of the study have shown that the treatment with carbon microgranulated HSGD enterosorbent: 1) didn’t stimulate tumor growth and metastasis; 2) decreased the metastatic injury of lung; 3) corrected the manifestations of paraneoplastic anemia and thrombopenia; 4) improved the morphological structure and functional potency of liver. So, the obtained data denote that ES-based therapy can be considered as advanced treatment of cancer patients directed on correction of several signs of PNS. This study has been supported by fundamental complex program of scientific research of Division of Biochemistry, Physiology and Molecular Biology NAS of Ukraine “Functional genomics and metabolomics in system bio­logy” in the frame of scientific project “Molecular-genentic mechanisms of paraneoplastic syndrome formation associated with tumor angiogenesis, and possible approaches for correction of pathologic alterations”. 1. Ngonga GF, Ferrari D, Lorusso L, et al. Paraneoplastic syndromes: pathogenetic theories, clinical aspects and therapeutic approach. Ann Ital Med Int 2005; 20: 28–38. 2. Pelosof LC, Gerber DE. Paraneoplastic syndromes: an approach to diagnosis and treatment. Mayo Clin Proc 2010; 85: 838–54. doi: 10.4065/mcp.2010.0099. 3. Mathew DG, Rooban T, Janani V, et al. Review of paraneoplastic syndromes associated with oropharyngeal squamous cell carcinoma. J Oral Maxillofac Pathol 2010; 14: 41–7. 4. Suzuki KM, Aiba K, Hatake K. Rapid progression of anemia related to tumor-lysis syndrome associated with bortezomib treatment in myeloma patients. Jpn J Clin Oncol 2014; 44: 435–41. 5. Tas F, Eralp Y, Basaran M, et al. Anaemia in oncology practice: relation to diseases and their therapies. Am J Clin Oncol 2004; 2: 11–26. 6. Caro JJ, Salas M, Ward A, et al. Anemia as an independent prognostic factor for survival in patients with cancer: a systemic, quantitative review. Cancer 2001; 91: 2214–21. 7. Jurado Gámez B, García de Lucas MD, Gudín Rodríguez M. Lung cancer and paraneoplastic syndromes. An Med Interna 2001; 18: 440–6. 8. Moiseyev SV. Anaemia in oncology diseases. Onkol Zhurn im PA Gerzena 2012; (1): 77–82 (in Russian). 9. Williamson LM, Lowe S, Love EM, et al. Serious hazards of transfusion (SHOT) initiative: analysis of the first two annual reports. BMJ 1999; 319: 16–9. 10. Tonelli M, Hemmelgarn B, Reiman T, et al. Benefits and harms of erythropoiesis-stimulating agents for anemia related to cancer: a metaanalysis. Can Med Assoc J 2009; 180: E62–71. 11. Jeske M, Flamme I, Shtoll’ F, et al. Replaced dihydropyrazolones as inhibitors of hif-prolyl-4-hydroxylase. Patent RU 2509080 C2. Bull 2014; (7). 54 p. (in Russian). 12. Ho W-B, Wright L, Deng S, et al. Chromene derivatives and use thereof as HIF hydroxylase activity inhibitors. Patent US N 8324405 B2, 2012. 13. Nikolayev VG, Mikhalovsky SV, Gurina NM. Modern enterosorbents and mechanisms of their action. Efferentnaya Terapiya 2005; 11: 3–17 (in Russian). 14. Fedorchuk OG, Pyaskovskaya OM, Skivka LM, et al. Paraneoplastic syndrome in mice bearing high-angiogenic variant of Lewis lung carcinoma: relations with tumor derived VEGF. Cytokine 2012; 57: 81–8. 15. Pyaskovskaya ON, Dasyukevich OI, Kolesnik DL, et al. Changes in VEGF level and tumor growth characteristics during Lewis lung carcinoma progression towards cis-DDP resistance. Exp Oncol 2007; 29: 197–202. 16. Solyanik GI, Pyaskovskaya ON, Garmanchouk LV. 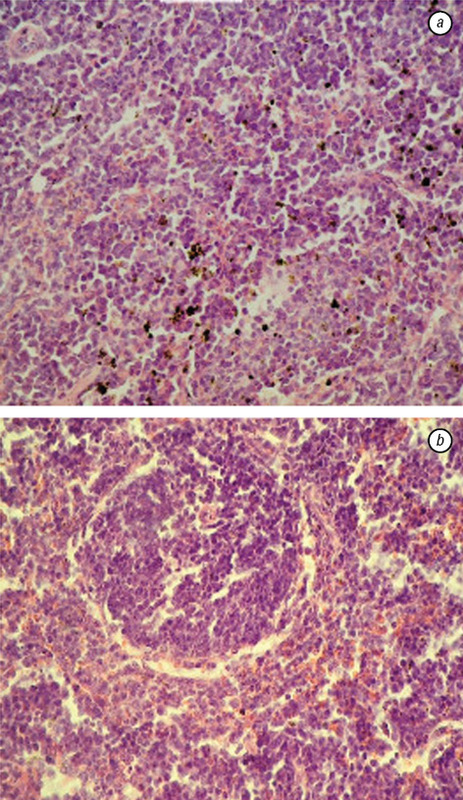 Cis­platin-resistant Lewis lung carcinoma cells possess increased level of VEGF secretion. Exp Oncol 2003; 25: 260–5. 17. Pyaskovskaya ON, Dasyukevich OI, Kolesnik DL, et al. Changes in VEGF level and tumor growth characteristics during Lewis lung carcinoma progression towards cis-DDP resistance. Exp Oncol 2007; 29: 197–202. 18. Solyanik GI, Fedorchuk AG, Pyaskovskaya ON, et al. Anticancer activity of aconitine-containing herbal extract BC1. Exp Oncol 2004; 26: 307–11. 19. Kolesnik DL, Pyaskovskaya ON, Dasyukevich OI, et al. Significant antimetastatic efficacy of metronomic low-dose oral cyclophosphamide against highly angiogenic variant of Lewis lung carcinoma. Exp Oncol 2010; 32: 94.